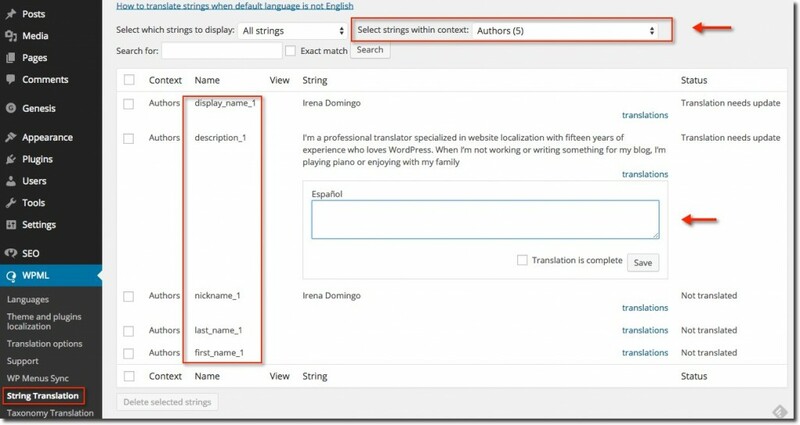 In this post I show you how to translate author information (biographical info) in WordPress using WPML (and String Translations module) or using a WordPress Multisite installation (and a plugin called Individual Multisite Author). You can translate author bio using WPML (WordPress single) or using WordPress Multisite. In WordPress Multisite, authors are shared throughout the network, so the bio is the same in each site and the text is untranslatable. This way you can’t have a perfectly translated website. Insert a widget at the end of each post (after entry). In Genesis, for example, you can insert User Profile Widget. There is a great plugin, Individual Multisite Author, that allows you translate the author information. This plugin adds an extra field to user profile page, called Site specific author information, for each single site in a multisite network. I’m using this plugin in this blog.